Do you have post-it notes all over the place with ideas for your book, scraps of paper with scribbled notes inside your desk drawer, thoughts on napkins, and lots of crumpled up written pages in your wastebasket? Join the club. Completing a book requires time, dedication, and brain power, as does any task worth doing. All are good excuses, but not valid reasons for not realizing your dream of being published. My research on the topic along with my experience as a writer who has now written four nonfiction books points to one key factor that impedes your ability to actually finish a project and come out with a good book in the end. It has nothing to do with the reasons mentioned above, but rather points to something akin to having too many cluttered closets. It’s disorganization. “This way” incorporated principles that were not based on “how” to write a nonfiction book, but instead how to first “organize” a nonfiction book before ever putting a word to paper. I learned that by adopting ten specific strategies before actually beginning to write you can generate a breadcrumb trail that easily leads you through your story from point A to point B to point C and so on, right to the end of your book. It really will practically write itself. I was so inspired by what I had learned, that I not only finished my first book but over the course of several years have since written three more nonfiction books using the same organizational strategies. 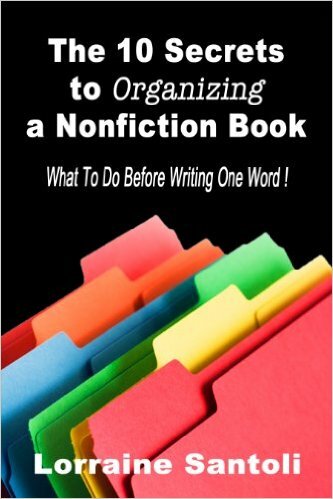 I always wanted to share that magical formula of essentially putting a book together before actually writing it and finally did so a few years ago with a step-by-step little e-book entitled The Top 10 Secrets to Organizing a Nonfiction Book. The ten secrets are detailed in an easy-to-read format that provides context for each step in the organizational progression. Never again will you have to ask yourself, “Where do I start?” and “Where do I go next?” when thinking about writing that book you’ve always wanted to tackle. Next Next post: Can You Name All of Your Company’s Business Segments?